Linux and open source software in general are not something meant for just hobbyists anymore (which I don't necessarily consider as a bad thing). It is widely used by multinationals in various forms, Goobuntu by Google and Sony PS4's Orbis OS being perfect examples. But the rise of Linux in the gaming scene has to be the most spectacular story of them all. 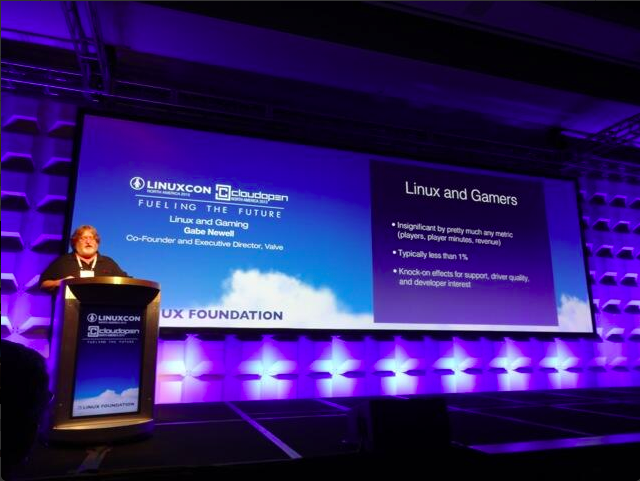 Valve's co-founder, Gabe Newell's keynote speech at LinuxCon was a testament to that. The center of gravity has shifted from console hardware platforms with price and access controlled by PC makers, to web-based free-to-play and massive multiplayer online games. As a result, businesses are investing in developers and services and users are the focus of market development strategies, Newell said. The realization that this was the new business model, led Valve to change its approach to game development. "Valve became convinced that Linux is the future of gaming," Newell said. Valve also builds and runs all of its source code, animation and assets on Linux - a typical setup for companies in the gaming industry, said Gabe Newell while speaking at LinuxCon. Full keynote speech by Gabe Newell at LinuxCon video below.